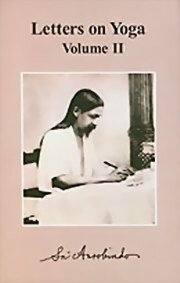 Letters to disciples in which Sri Aurobindo explains his teaching and method of spiritual practice and deals with problems that confront the seeker. Sri Aurobindo was an Indian/Hindu nationalist, scholar, poet, mystic, evolutionary philosopher, yogi and guru. After a short political career in which he became one of leaders of the early movement for the freedom of India from British rule, Sri Aurobindo turned to the development and practice of a new spiritual path which he called the "integral yoga," the aim of which was to further the evolution of life on earth by establishing a high level of spiritual consciousness which he called the Supermind that would represent a divine life. Sri Aurobindo wrote prolifically in English on his spiritual philosophy and practice, on social and political development, on Indian culture including extensive commentaries and translations of ancient Indian scriptures, on literature and poetry including the writing of much spiritual poetry.